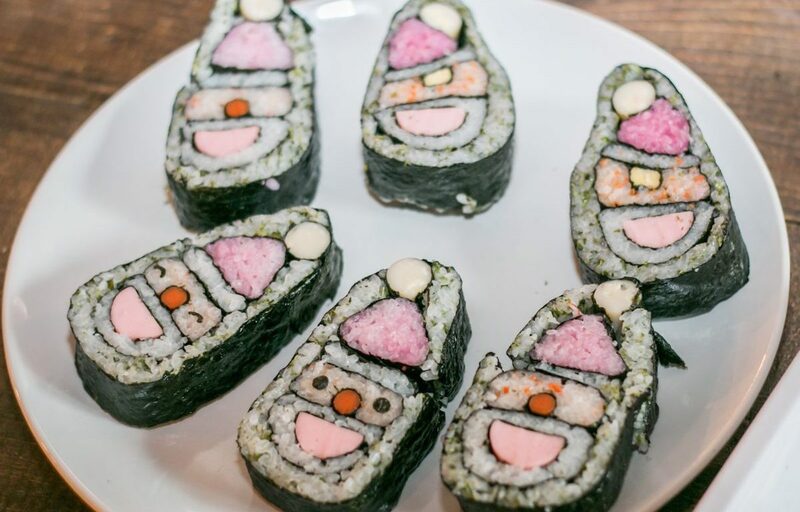 Tuesday, December 18 from 6:30 p.m. until 8:30 p.m.
Get in the holiday spirit and make your own adorable sushi! Kazari Maki-Zushi is a patterned or decorative sushi that is derived from several sushi techniques such as Saiku sushi and Futomaki sushi. It is undoubtedly sushi, but the appearance and design of each roll can be anything – flowers, fruit, animals, words, and even logos. Using various natural colors of ingredients you see every day, Kazari Maki-Zushi is a fun way to play around with sushi designs. Although this food/art form was developed more than 150 years ago, new ideas are created every day in Japan. At this RESOBOX workshop, participants will create two kinds of holiday sushi using natural ingredients. The Santa and penguin sushi will brighten up any holiday party The cute designs on these holiday sushi rolls can be made easily, so no sushi-making experience is required, and it’s a good way to impress your friends at upcoming holiday parties. Although it looks difficult, this decorative sushi is very simple and easy to make. Each piece is stacked to make a picture, not unlike building Legos. Kazari Maki-Sushi represents an important unique aspect in Japanese food – not only in taste, but also in the beautiful visual appearance that serves to please those who enjoy it.